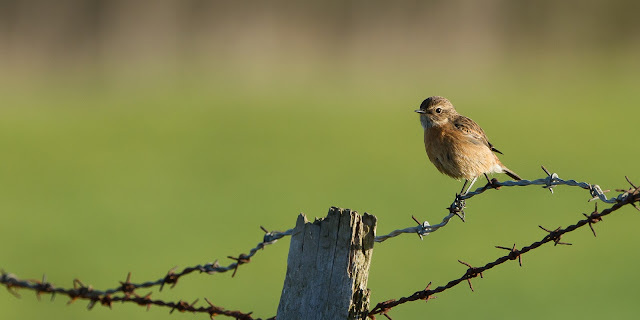 I found stonechat today; my first ever locally. I dismissed it as a robin at first as my eyes caught it in silhouette flying to perch on a fence post. But a recent conversation I'd had with Nick Morgan reminded me to check every bird - it's really not an effort to lift the bins to your face! And I'm very pleased I did, a splendid first winter female. Continuing my southern patch route turned up more signs of Spring. Reed bunting and dunnock provided the sound-track for the morning. The reed buntings in particular were in amorous mood with one male displaying to a pair of unimpressed females. He flew in a slow arc, flapping his wings furiously, recalling skylark in its characteristic low hover. I watched him for a short while, but was distracted by a warbler. It didn't call, but given the time of year I presume it was a chiffchaff. A pair of kingfisher excavating a nest hole grabbed my attention, and I watched as they flew not along the river, but across a field to their feeding grounds. Presumably an adaptation to draw attention away from the nest? The river is sure to swell this week with the predicted rains, but once it settles I'll set up my hide at the feeding site and try and improve my woeful portfolio of kingfisher photos. At home I completed my jobs in the garden before heading inside and heard my first confirmed chiffchaff of the year. Later this evening, the number of sightings doubled as a bird belted out its song in the wood around the oxbow lake. At the northern stretch of the Swale, I flushed green sandpiper once more. The pair of grey wagtails were still present and subject to their nest not being waterlogged with the pending rains, are looking like a good bet for another photo project. As I stood watching them in the distance, I heard a splash a few metres away. I couldn't believe it; two moles had forced their way out of the bank and fallen in the river. I watched as within seconds they had both scrambled back up the sandy bank and into the hole from which they came! I presume they were two males fighting that lost their bearings.